We just had my son's tenth birthday party recently and it was a big success! 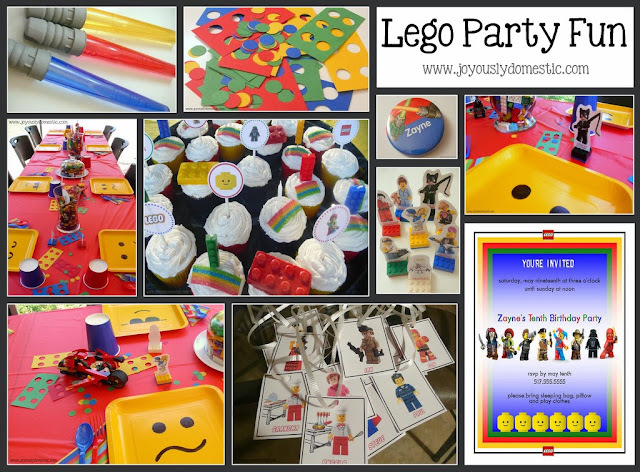 Of course, it was a Lego theme! We've had specific Lego themes in the past for his birthday, such as Star Wars. But, this year we did a general Lego theme with primary colors and incorporation of many types of Legos ... Ninjago, Star Wars, City and others. I did a lot of work creating printed projects for this one ... more than I've ever done for other parties. It's pretty amazing what one can do with a basic photo software program and a printer these days. 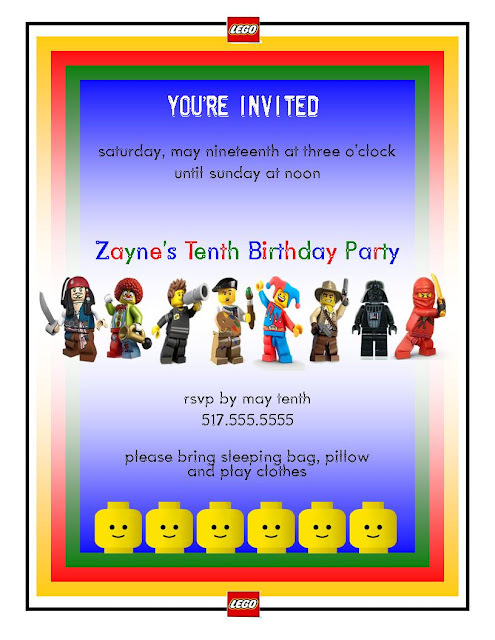 And, due to the fact that there really is limited Lego-themed party stuff out there to purchase, this was a great route to take that allowed my creativity to be put to work ... all while doing it pretty inexpensively. First, these are bubble wand sticks that we purchased for $1 each at Wal-Mart. Just by spray painting the top handle part gray, we turned them into light sabers to go along with the Star Wars part of the Lego theme. Each child received one along with their party favor bag. Here's a photo of the painting process and how they looked completed. Here is a cute, little button that I purchased awhile back online at birthdayinabox.com for my son to wear on his special day. It was a couple of bucks. We created these place settings with Lego figures and names to mark the spots for the kids at the table. We made this giant "confetti" to scatter around the tables by using card stock in primary colors and a circle punch. Here is something neat we created for the adults at the party. We found photos of mini figures online and matched them up to the careers and interests of the guests, then we created a "necklace" for them to wear at the party. My kids were super excited to pass these out to their grandparents, aunts and uncles. Here's a photo of the plates we made using square, yellow party plates and a non-toxic black marker. After having no luck finding yellow, square plates at Wal-Mart, Target and a local party store, we ended up ordering some online on one of the party websites for around $4 (plus shipping) for a pack of eighteen. I must give credit to a fellow blogger at Teal and Lime for the idea. She has a great blog! She's, also, the one I got the giant confetti idea from ... she is brilliant at party stuff! And, here's everything piled up on my kitchen table the night before ... we were super excited to get the outdoor tents and tables set up the next morning so we could set everything up. And, here is a photo of the party favor bags set out the night before. The bags were three for a dollar at Wal-Mart and came in several colors. We chose to do red, green and blue. Then, we created something to go on the front to thank the children for attending the party. We attached them with double-sided tape. Candy, a juice box, Lego pencils (ordered online), glow sticks, mini water squirt guns and a few other things went inside. These were passed out to the kids along with the light saber bubbles. We presented the bags on a large, gray Lego base. We made some double-sided signs of various Lego sets on the computer that we hole-punched, strung with ribbon and hung around under the tent. 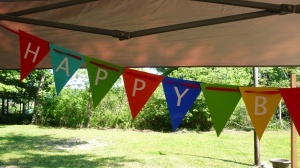 This added to the "Happy Birthday" pendant banner purchased at Target for around $4. Target and Wal-Mart, also, both now sell polka dot balloons, which went along well with the "dots" on top of Lego bricks, I thought, so we used those ... hung upside down with ribbon under the tents. My mother lovingly made the birthday cupcakes ... doing a combination of classic chocolate and confetti flavors with white frosting. We had a variety of things to put on the cupcakes. I let my thirteen-year old daughter and my seven-year old niece decorate the cupcakes! I made Lego-themed circles on cardstock on the computer and we mounted them on sucker sticks from the craft store. We had a few white chocolate (color-tinted) Lego bricks ... I purchased two molds online for around $13. And, we used some strips of sugar-coated sour candy "belts" to lay across some of the cupcakes since the colors matched the theme. Also, we found brick candles at Target for around $3. There are many great ideas out there online for Lego-themed food ... food made into the shape of Lego bricks and such. But, we're pretty goods eaters on both sides of our families and the ideas I was seeing were more finger-food items, so we went with a basic cook-out and sides of potato salad (my son's favorite! ), homemade macaroni and cheese, chips, watermelon slices and such. But, if you're wanting to follow a lighter menu for a Lego party, do the research because there are some really cute ideas out there! I used some of his already-constructed Legos to run along the center of the tables ... a dump truck and other things he loves and was proud to show off! And, here is the birthday boy on his new bike that he got for his birthday! It was a fun-filled day and all of the children that attended had a blast! Hi I am wondering if the plates smeared once they had cake or ice cream on them?